A beautiful, illustrated story about a magical group of butterfly buddies as they explore and discover their small world in an attempt to fulfill their dreams. Step into a beautifully illustrated story, introducing a world of imagination and immerse into a day of play with a group of butterfly friends—and one who was different in The Day We Rode the Rainbow written by author Jodi F. Mays. Experience a small world come alive through rich, happy colors and whimsical drawings of pure imaginative and enchanting illustrations in this wonderful book. Fly away with a magical group of butterfly buddies composed of the twins Daisy and Lily, Spruce Jr., Little Koa, Salvio and of course, Basil, the butterfly with gray, drab-colored wings as they explore and discover their small world in an attempt to fulfill their dreams. 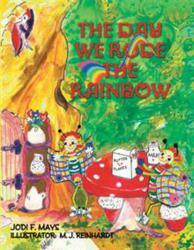 The Day We Rode the Rainbow is an interactive, fun story that shares invaluable lessons to readers such as finding friendship, self-acceptance, and tolerance while the butterfly friends strive to “ride the rainbow” and learn new things about themselves. More than an enjoyable ride into a world of adventure and discovery, The Day We Rode the Rainbow definitely adds inspiring colors to those who seek, find and fulfill the rainbow of life. Jodi F. Mays was born in Boston, MA. She moved with her family to Austria at a young age. She obtained her business and marketing degree in Europe and is currently living in California and Europe. M. J. Unterwurzacher is an Austrian illustrator. She enhances the mood and fantasy of young readers by using rich, happy colors and a whimsical approach making new worlds come alive through her imaginative and enchanting illustrations.